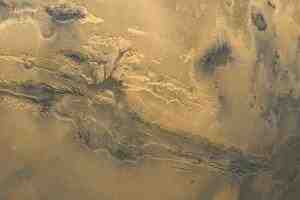 Check out some of these Mars photos. This is a detail from a gigantic mosaic of the whole planet, which is pretty awesome to see. This valley here dwarfs anything on earth, spreading across almost the enire disk, and making the red planet look a little bit like a practice-range golf ball.